The Havanese is a very fun dog that loves to be the center of attention at all times. If its owner is not paying it attention, it ensures that it steals the spotlight back with distracting actions so it cannot be ignored. It is a very playful, energetic breed but does not have the stamina of some other dogs because of its tiny size. This means that excessive exercise will not be able to be tolerated by this small dog. 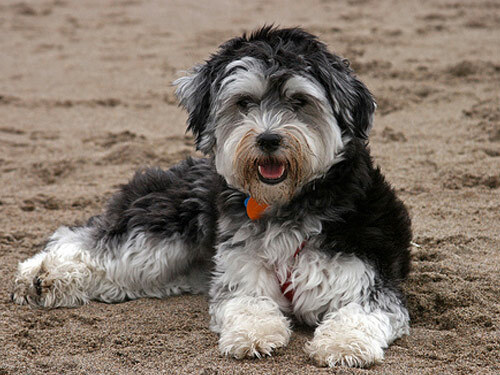 When approached by strangers, children, pets, and other dogs, the Havanese is very friendly. It loves to please and is a very quick learner. Although this dog has tons of energy, it can not go on walks or runs for long distances. This is because its body is fairly small. It can certainly take short walks or play fun games, and this is definitely recommended, but the Havanese will just need to limit its activity or it will grow tired very quickly. It does not shed its long coat, however, because of its coat’s length, it does require combing and brushing about three to four times per week. This will ensure that it stays tangle free. Havanese are actually one of the few breeds that are not incredibly susceptible to major health concerns. Despite their short frames, they somehow managed to steer clear of chronic conditions like Chronic Hip Dysplasia. However, chrondodysplasia is sometimes seen in this breed. This condition causes the cartilage between limb joints to soften causing the bones to become deformed. It can be crippling, along with visible limb deformities if not treated early. Patella luxation is also commonly seen in this breed and is something that should be looked out for. Other conditions that are occasionally seen are Legg-Perthes, elbow Dysplasia, portacaval shunt, mitral valve insufficiency, and deafness. In order to keep your Havanese healthy, it is recommended to get your dog tested for eye, knee, cardiac, hearing and hip issues. If your Havanese stays healthy, it can live up to 14 years of age. This dog was originated in the ancient times out in the Mediterranean. The dogs were originally given as gifts to Cuban women in an effort to open a trading relationship with them. In those days, very similar to the small-dog trends in Hollywood that are seen today, the Havanese was pampered and looked upon as a special pet owned by the wealthy and glamorous. When they made their way to Europe, they became show dogs and were often found in circuses performing tricks. However, their household popularity began to dwindle. It became so bad for this breed that they were very close to once becoming extinct in Europe and also where their roots were; Cuba. There were very few in Cuba at this point and time and three were then brought to the United States with Cuban families during the 1950’s stretching into the early 1960s. In 1996, they were officially recognized by the AKC and in 1999 they were even recognized as part of the Toy Group.